The Xclip CL42 is an extremely lightweight and versatile unit. 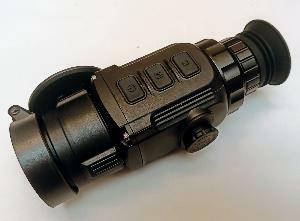 It can be used as a very small, very high quality, handheld spotter with 3x native magnification (up to 12x with digital zoom) or the eyepiece can be very quickly changed for front mounting to your rifle scope to convert it into a thermal rifle scope! Due to the precisely designed and matched optics of the objective and eyepiece, the CL42 does not loose zero, or require exact mounting. It is also very lightweight at 420 grams. Dimensions are 154x58x61mm. The units are factory preset and collimated but If there is any error due to the position of your erector tube in your day scope, this can be electronically adjusted out on the CL42 so your POI is the same with or without the unit. The unit has a 42mm F1 lens system which is coupled to the latest 384x288 50Hz, 17 micron VOx thermal core to provide the sharpest image and sensitivity. This is then output to the 1024x768 OLED display. The unit has modes for standard conditions and also a high gain mode for fog and rain. The unit is powered by 2 x CR123 standard or re-chargeable batteries, with a run time of up to 4 hours. The unit can be put into and woken from sleep mode with a quick press of the power button to conserve power. When used as a clip on it is compatible with any day scope. 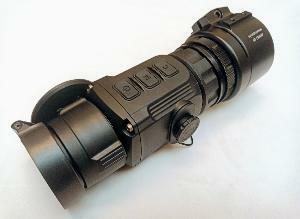 We advise scopes with a bottom end magnification of around 3-4x maximum. In practical use it is possible to use 10x and more magnification on the day scope to precisely place the shot if necessary. 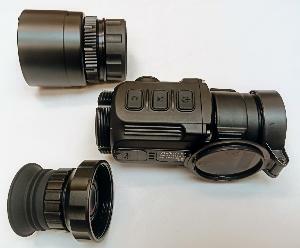 The unit is supplied with case, video/power lead, rifle mount eyepiece and monocular eyepiece. Also for a limited time we are supplying the required Rusan adapter to fit to your day scope free of charge. Just let us know the exact outside diameter of your day scope's objective lens.